Afteroom is a design company in Stockholm and an advocate of the traces of time. Founded and directed by Hung-Ming Chen and Chen-Yen Wei, the mission is simply to create beautiful products which will add value over time – design to grow old with. The inspiration derives from an intriguing interest of forms, scenes, proportions, materials and cultures. The philosophy pivots around simplicity and honesty. Erik Olovsson is based in Stockholm and runs Studio E.O, a multidisciplinary design practice. He has an MA from Konstfack, Sweden in 2012 and has a background as an Art director for the creative collective Acne. Olovsson’s work has a focus on methods and creating systems when designing. Harri Koskinen (born in 1970) has an uncompromising, bold design aesthetic that has gained him international renown since the early days of his career. Practicality, a spare style and a conceptual approach to product and spatial design are Koskinen's trademarks. In 2009, Koskinen launched his first namesake collection, Harri Koskinen Works. In January 2012 Koskinen was appointed Design Director of the Iittala brand. Koskinen's works have been on display in exhibitions around the world. He has been awarded several major design prizes, such as the Kaj Franck Design Prize (2014), the Torsten and Wanja Söderberg Prize (2009), the Pro Finlandia Medal (2007) and the Compasso d'Oro prize (2004). John Astbury is a furniture designer working with his own studio in Stockholm. Following a BA in Anthropology and Sociology, he graduated in 2011 from the MFA industrial design program at Konstfack, Sweden. Since graduating, he has shown pieces in New York, London, Tokyo, Paris and Milan. His work is based on conversations. Kyuhyung Cho runs his studio in Stockholm, working on a wide range of design field, graphic, furniture, textile design, and illustration. He studied Storytelling at Konstfack in Stockholm and Graphic Design at Konkuk University in Seoul. He has a unique way of writing his own story and transforming it into form and composition in function. Matti Klenell lives and works in Stockholm. Since graduating from Konstfack, Stockholm in 1999 he has worked with design commissions for various manufacturers in Europe and Asia. Simultaneously, he has developed his own and unique language as a glass artist with several solo exhibitions and public art commissions. These two tracks of his profession often influence and interact with each other. Mika Tolvanen is a Finnish product designer who started his own studio after graduating from the Royal College of Art in 2001. In 2012 he received the Bruno Mathsson Prize and he now works for a number of international clients. Together with fellow designer and wife Julie Tolvanen, he founded Studio Tolvanen in 2015. They share a workshop and studio at a former bakery in the Töölö neighborhood of central Helsinki. Peter Andersson is a designer based in Stockholm. His mission is to design everyday objects, aiming to give them a twist towards the unordinary and unexpected. The projects range from one-off objects to mass-produced products. TAF is a Stockholm based design and architecture studio founded by Gabriella Gustafson and Mattias Ståhlbom. Since its foundation in 2002, it has achieved international acclaim with a portfolio of work spanning touring exhibitions, interior design and a number of commercially successful products for different prestigious manufacturers. Yuko Maki is an architect and a designer based in Japan. After she studied architecture in Japan and Finland she moved to Sweden and learned interior architecture and furniture design at Konstfack. Her design is based on the context behind the projects in spite of the scale. The outline of the design appears spontaneously when she reads the context carefully and arranges all the information by studying. 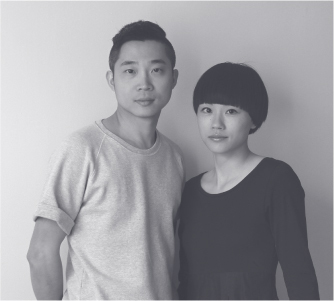 Yun Li is a Paris-based Taiwanese industrial designer. He graduated from the École Nationale Supérieure de Création Industrielle (Ensci-Les Ateliers) with honor in 2014. For his final project, supervised by Jasper Morrison, he attempted to refine, both visually and technically, one of the world's most visible and mass-produced chairs. He focuses on finding better balance between cost and quality a product could have.